“Go. See. Do. : 10 Life-Changing Quotes to Be Successful as a Young Professional” helps readers create their own path to success through the author’s empowering stories and motivational words of wisdom. “Go. See. 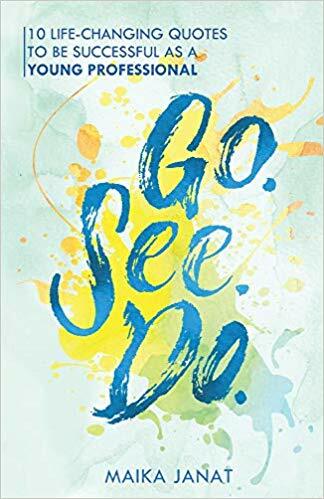 Do.” taps on real-life experiences and lessons in order for readers to know how to honor themselves and maximize their own journey towards personal fulfillment. As a recognized event professional, Maika Janat has worked and helped many individuals from different walks of life. Her career has taught her lessons that guide her through life and towards achieving her own success. This time, she wishes to share her own wisdom and guidance to those who are seeking their own success and working on achieving their goals and dreams in life. “Go. See. Do.” is a wisdom-filled book that goes beyond sharing motivational words and extends valuable insights through stories that reach out to young professionals who are working on becoming the best versions of themselves. Through the author’s words and stories, each reader will learn how to make room for more achievements in life and their careers. As readers discover helpful wisdom and guidance from the author, they will get to find ways on how to effectively navigate their career and the choices they make. The book also guides readers on how to harness their skills and talents, make room for more personal growth, earn respect from their colleagues, and staying strong through life’s difficult times. Most of all, “Go. See. Do.” taps on real-life experiences and lessons in order for readers to know how to honor themselves and maximize their own journey towards personal fulfillment. Indeed, Janat’s encouraging and empowering self-help is worth-reading for all success-seeking individuals everywhere. Soon, “Go. See. Do.” will reach out to a wider audience as it is set to join the celebration during the upcoming 2018 Miami Book Fair International. Happening on November 11-18, 2018, book lovers, literary greats, writers, and publishers will gather during this highly-anticipated affair. Therefore, it’s definitely worth checking out! Maika Janat is a Portland-based creative and event management professional by way of Frankfurt and Berlin, Germany. Maika worked for a well-respected event production company for 13 years and grew as an intern and producer in Frankfurt to become the U.S. branch president of satisfy in Portland, Oregon. After running the company’s U.S. interest in Portland for just two years, she was honored by the Portland Business Journal as one of its 40under40 awardee at the age of 31. Maika has taken a break from the event world to write this book, give birth to her wonderful daughter, Lucy, and add to her massive sneaker collection gathered from around the globe! This book summarizes her event career in a practical sense, delving into her real-life experiences, her inspiration, and her motivation. Maika is a true testament to the fact that hard work, commitment, authenticity, and a “go.see.do” attitude are key ingredients to success.